Wednesday afternoon we were blessed with another session with church leaders. We again had about 20 in the room, and the combined number of first generation churches planted was around 240. It was a great privilege to hear from six of them including one gentleman who is a Muslim background believer who has planted a very impressive number of churches in his area. During this session our team was also asked to share our testimonies. We heard one key theme again today. The Community Learning Centers afford the CLC leaders with both access into and acceptance by local communities. We have heard several church leaders share this week how they experienced meager ministry results from years of traditional effort (typically move into an area, evangelize, and build a church building). Any converts were quickly ostracized from their family and community. However, with the CLC approach of meeting needs and building relationships, CLC leaders are able to identify “people of peace” (Luke 10) who receive Christ and then, in turn, they win their families and friends to the Lord. The CLCs are very well received by community leaders, both Christian and non-Christian, because of the uplift they provide to the community, and this results in open access to villages. Regarding this point, during one of our sharing times with Victor John, it was observed that compassion ministries are largely unique to the Christian community in this part of the world. After lunch, the ladies did some shopping for the children and returned with a nice supply of infant clothing, diapers and toys for the older kids. These were hugely appreciated. We concluded the day by completing our trifecta of “planes, trains and automobiles” with a 14 hour overnight train ride to New Delhi. 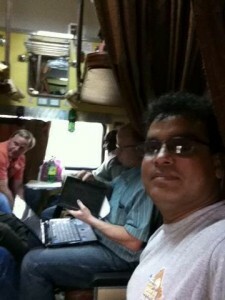 While the camaraderie was much enjoyable the accommodations in the sleeper car were not.